I’ve always loved cooking and baking the cuisine of mi homeland, but ever since we got back from our recent trip down south, I’ve been on a total Mexican food kick. I’m talking everything from homemade salsas and guacamole (recipe to come) to my Tempeh Fajitas and Mexican stuffed Carnival Squashes (inspired by this recipe). My most recent concoction, however, was something I’ve always been somewhat intimidated by and never before had the nerve to tackle– Enchiladas. I don’t know what it was about enchiladas that always made me fear making them for mi familia. It could have something to do with their being an item that required rolling up and I lack the proper grip and dexterity such as thumbs. Or it could be due to my failed attempt at making cannoli’s three years ago for mi papa’s annual Bocce ball celebration in honor of his Italian heritage. I’ll spare you all the details but just picture a big batch of blackened fried pastry dough, a kitchen full of fire extinguisher powder and mi mama’s number of eyebrows being reduced from two to one. Not a pretty site… and the kitchen looked pretty bad too. Whatever the reason may be, it wasn’t until two nights ago that I decided to overcome my fear and hesitation and just jump in with all four feet. And much to my amazement, they turned out to be not only incredibly delicioso, but amazingly easy as well. I made mine with chicken but they could easily be made vegetarian by either simply deleting the meat all together, or substituting a batch of chopped homemade vegan sausage or a package of tempeh or pressed tofu. The possibilities are endless. And now that I know how easy they are to make, I’ll definitely be making them again. Check one off my list of New Year’s Resolutions! 1) Heat canola oil in a large skillet over medium. Add chicken, onions, bell pepper and garlic. Saute until onions are softened and chicken is no longer pink. 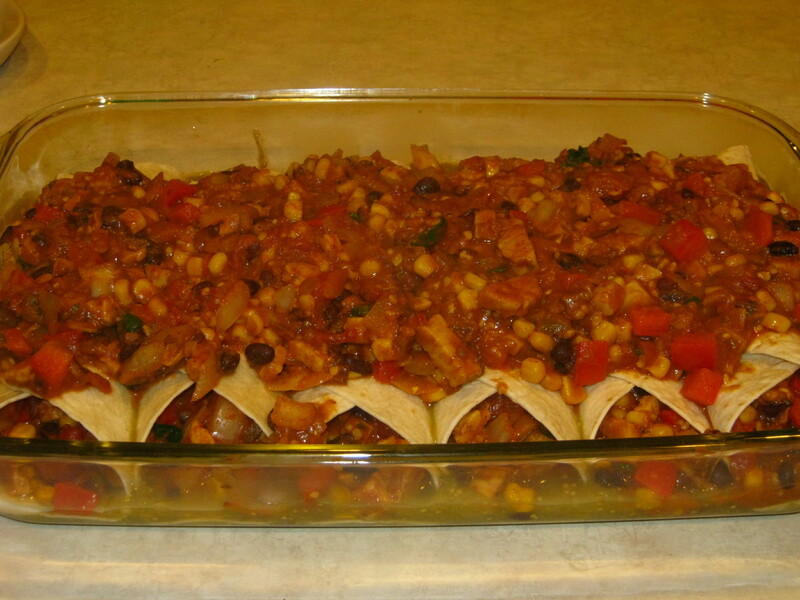 2) Add jalapeno pepper, tomatoes, beans, corn, 1/4 cup verde sauce and spices. Reduce heat to medium-low and let simmer 10-15 minutes. 3) Heat tortillas in microwave 15 seconds to soften. Spread remaining verde sauce on bottom of 13×9″ casserole dish. 4) Spread 1 cup of chicken mixture down the middle of each tortilla. Roll up like a cigar (or cannoli) and place in dish. Repeat with remaining tortillas. 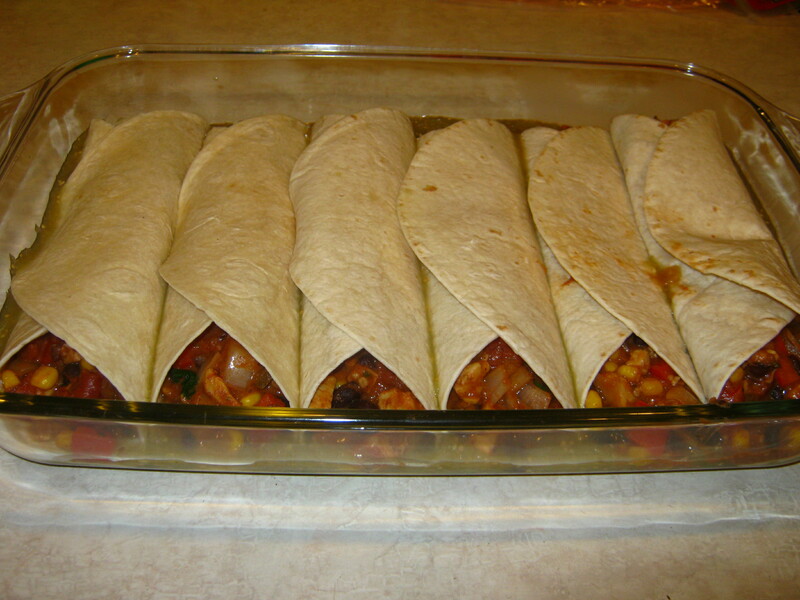 5) Top enchiladas with any remaining chicken mixture. 6) Bake in pre-heated oven at 375 degrees for 15-20 minutes. Top with shredded cheese and bake an additional 5 minutes until cheese is melted. 7) Serve with sour cream, chopped green onions, guacamole etc. and enjoy! After overcoming this little phobia of mine, I feel like I can finally take on anything else that may cross my path. Like playing a piano concerto in front of a huge audience at Madison Square Garden this coming Sunday. 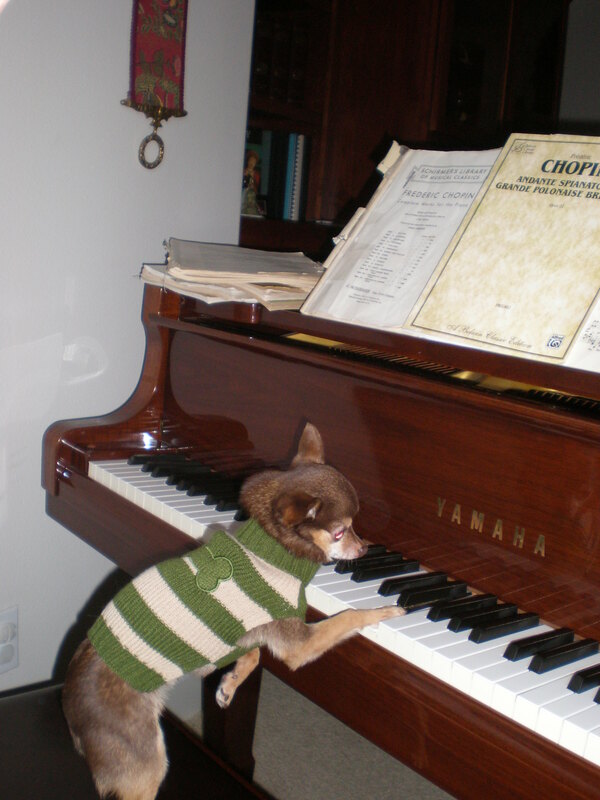 Better go brush up on my ivory tickling. Wow! Those look good. I don’t make enchiladas either and I don’t know why because I love them. I’ll be trying these for sure. What time does the concert begin? I’d like to get a front row seat. For some reason enchiladas really intimidate me as well. I dunno why though! They seem fairly simple. And theirs so versatile which is great!